It pains us to see the damage occurred to this hard working business owner, Bob Kahana, who has put so much time and effort into building his popular business, on top of losing a dog in the large Kalaeloa brushfire. But we are inspired by his resilience - "Yeah, well, we started from nothing. We'll get it back up." We are with you, Bob, and hope you and your business spring back onto your feet. 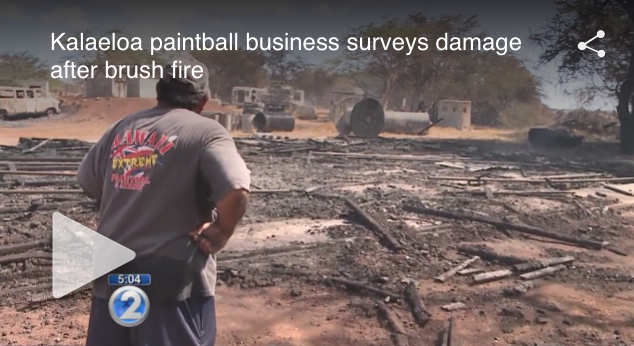 "Bob Kahana, co-owner of Hawaii Extreme Paintball, says a dog did not survive the fire, and nearly three acres of the property burned down. Kahana estimates the fire will cause about a 60-percent loss in business.